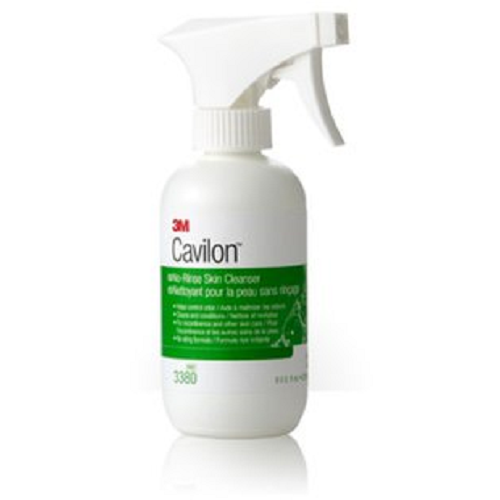 Cavilon, BUY Incontinence care cleaning, perineal care cleansers, skin cleansers, incontinence care, 3380. 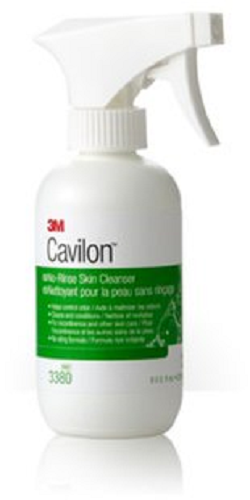 Cavilon's No-Rinse Skin Cleanser, by 3M, makes personal cleanup easy and both protects and moisturizes skin. A real relief for those whose skin gets irritated from constant cleaning of urine or stool. It's fine for those with healthy skin too. The No-Rinse Cleanser saves time, effort and further cleaning supplies, because you need only the single solution -- no need for water during the cleanup process. Along with daily incontinence cleaning typically associated with incontinence, the No-Rinse Skin Cleanser is good for all other body fluids as well. Medical staff and caregivers can have piece of mind knowing that they need little else for daily skin cleanup. The applications are broad and can be quite handy in nearly all medical settings. It's also good for diabetics and caring for their feet. The product is easy to use and has a nice fragrance. It can go anywhere with you. The nursing home my Father was in used it and it is great stuff. Not the cheapest out there but I like it the best. We buy the case to save money.